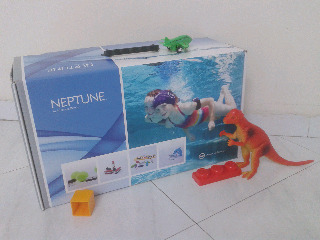 Aarav's journey to hearing......: The Neptune is here !!! We got the Neptune yesterday. First impression?? It. Is. Fantastic. Cute, Small, Funky and fashionable. We went to KEM by 1:00 pm yesterday.. Our audiologist was already ready with the setup for the mapping and she explained to us all about Neptune. How it is to be used, the batteries, the dry kit, accessories, dos & donts. An audiologist from Advanced Bionics had also come to assist for the first mapping. We removed the PSP and Aarav wore the new little Neptune. Now, removing the PSP dint feel so bad. I used to feel a bit sad every time I had to remove the PSP to give him a bath, or in the rain. Or before he wanted to sleep. Before, because of the bulky rough harness. It usually is kept on only in the afternoons for his quick naps. Maybe tonight Aarav will sleep with the Neptune on? The Mapping was done, the documents were signed and PSP was kept away. Then we took the BIG huge Neptune kit box and said our good byes. On the way back home, Aarav was in the car seat, the music player was playing a rather noisy bollywood number, and we were waiting at a red signal. Then I covered my mouth and said out the 6 lings, and Aarav identified all!!! Again I repeat, with the music on, at a red light with horns honking, Aarav heard!!! Wow!! I believe ClearVoice has made a point!!! Impressed!! We dropped Aarav back to the daycare so that he could rest a while, and Kaustubh and I went to finish a few chores. The PSP has now been packed securely in its box. And Neptune accessories organized. There are sooooo many wearing options!!!! Such a big box for this teeny little thing! A lot more to learn now!!! Came evening, we brought Aarav back home and his usual routine continued. We were far too busy being happy with the small size of Neptune that we almost missed a few observations.. The boy was babbling like never before!!! Non-stop. And as if he was conversing with himself!! He never babbled with this frequency!!! Yes yes, it was present but only when he wanted to communicate. Now he is playing with his own voice. Yesterday night, Aarav slept with the Neptune on.. Unlike the PSP harness, the Neptune was not 'on' him so he still wore it.. , I just kept it beside his pillow and the magnet still connected. I sang him good night and he watched me. "So Mom does say something when her lips are moving.. eh?" He paid attention to my voice, smiled and patted me when I sang him lullabys. Lullabies when sleeping at night. Such an ordinary event for the rest of the world.. But for us?? This happened for the first time in Aarav's life!! Such seemingly small unexpected joys make life much much better!! Thank you Advanced Bionics ! !